Do you want to build a railing or handrail that will meet the IRC residential deck railing loads requirements? Design Load or Tested Load? Design loads specified in the code are often different from testing loads especially with wood. For the actual deck railing test methods, details and limits, you should get a copy of Acceptance Criteria for Handrails and Guards - AC273/ASTM D 7032. This is a test to measure the strength of the load resisting elements between the posts such as balusters, spindles or panel fillers. An area the size of one square foot must handle 125 lbf. This test is where the top rail of the guard system has to sustain a maximum uniform load of 125 plf applied vertically or horizontally. In this test the top rail of the guard system must hold a point load of 200 lbf and the deflection at the loading point must be within certain limits based on the post spacings. This is done at several points along the rail - mid span, adjacent to a post and at the top of a single post. A safety factor of 2.5 is applied to the 200 lbf design load which becomes equivalent to 500 lbf when administering a test. Please note that the standards in the diagram below do not reflect the safety factor of 2.5 which is fine as long as an engineer approves your railing design using standard engineering principles. The 2.5 safety factor only comes into play when a specific test for a product is required. 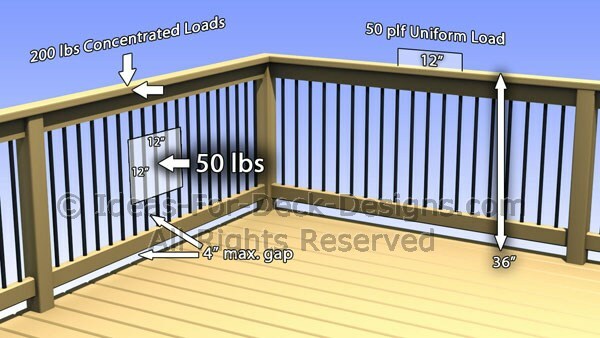 Those are the critical load values for residential guard deck railings to keep in mind. But this is a big topic and there is a lot more to learn.